Our school can always use help from the community to raise funds to be spent on our students education. If you have an idea for a fundraising project, please contact any office! We will be holding more fundraisers and welcome input and help from our community. Your contribution really makes a difference. Thank you! Our schools participate in the Box Tops For Education program. Box Tops can be found on hundreds of products. For a complete list, click HERE. Please collect any Box Tops that you see, and send them with your child to school. You may also drop them off at the Elementary or the MS/HS offices. Our schools participate in the Labels for Education program. Labels for Education can be found on hundreds of products. Please collect any Labels for Education labels that you see, and send them with your child to school. You may also drop them off at the Elementary or the MS/HS offices. Our Music Program also collects refundable bottles and cans to benefit the music program. 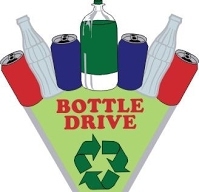 Please contact the school office to drop off any cans or bottles.